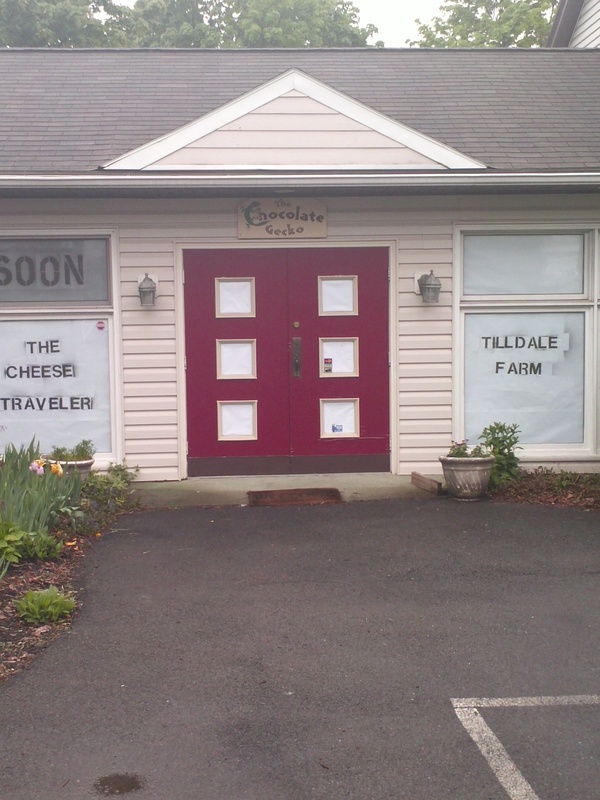 Many supporters, eager customers, neighbors, and passersby have noticed The Cheese Traveler’s sign in the window since it went up at the beginning of May when we signed our lease. And many have wondered when we anticipate our opening date. We shall say that we have completed remodeling and are in the permit-securing phase. The Cheese Traveler is a small, family-run cheese shop that sells local, farmstead and artisan fine cheeses. When we open at 540 Delaware, our product line will expand to a wider selection of farmstead and artisan cheese from the U.S., Canada, Europe, and British Isles and include fine charcuterie (cured meats like — artisan Prosciutto di Parma, Jamon Serrano, Jamon Iberico, salumi, and pate) and artisan specialty foods — crackers, mustards, jams, chutneys, olive oils, vinegars, chocolate and other confections, etc. 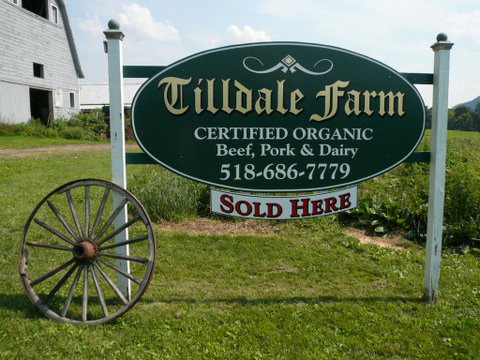 We will also feature Tilldale Farm Products’ organic, grass-fed, heritage breed meat — Devon beef and Tamworth pork — poultry and eggs. Since taking over the space at 540 Delaware, The Cheese Traveler and Tilldale Farm have added plumbing and refrigeration to support a world-class, cut-to-order cheese shop and fine food market. 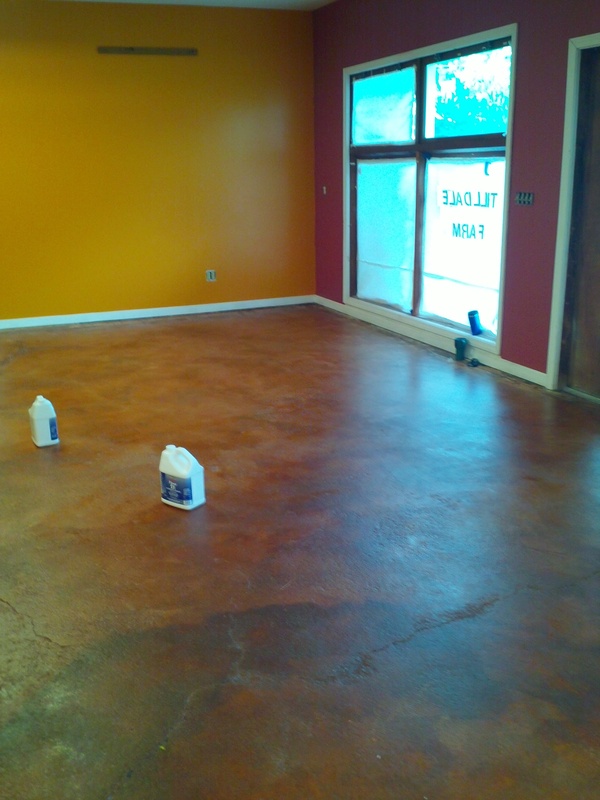 We refinished the poured concrete floor using sustainable soy and water-based products (this alone took two and a half months to do!) and gave everything a fresh coat of paint. 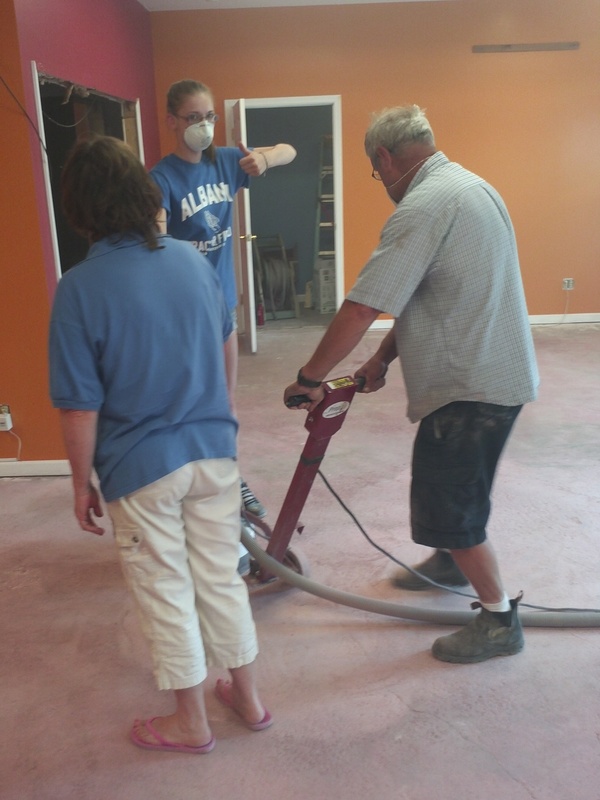 Bubba and Sissy brush-sanding the concrete floor to prepare the stain. 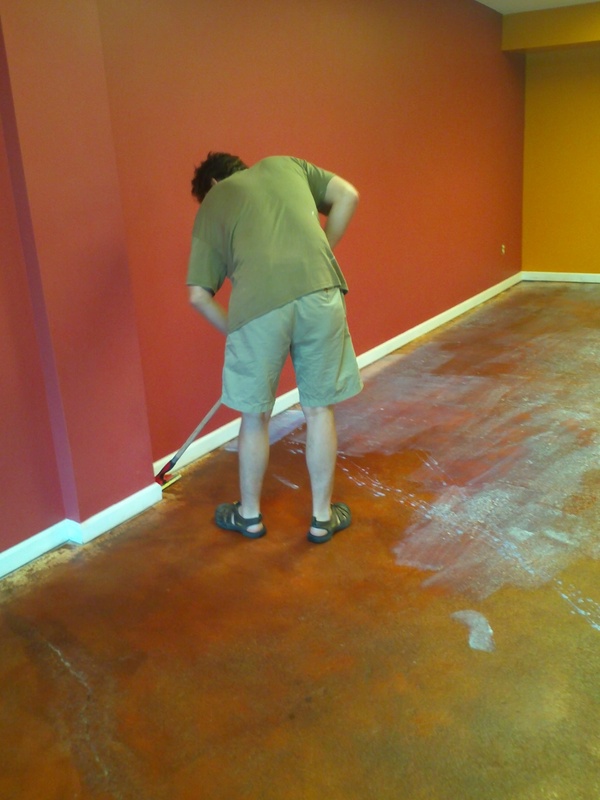 Of course now much of this floor you see here is covered by coolers and metro shelves. We are at least two weeks out from opening…possibly four depending on the city. Lastly, our logo is nearly finished and ready for signage. In the meantime, please spread the word, keep up your interest, and visit us for local cheese at the markets. By the way, we are so excited to be next to our neighboring businesses All Good Bakers bakery and cafe (of the delicious new semifreddo) and Mingle, an upscale, asian-fusion, world cuisine by the same chefs who brought you Avenue A. For a taste experience, try the Flavors of Del-So Cheese Board featuring our cheese, All Good Bakers’ flatbread and your choice of beer or wine flight. Spread the love! You’ve seen it. Gas stations crop up across the street from one another. Coffee shops on opposite street corners. A particular stretch of Route 20 in Guilderland could be renamed “Dress Shop Alley.” In a one half minute stretch, there are the three formal dress shops and a smattering of women’s consignment stores. Of course, each shop is a little different. Fancy Schmancy, for example, is a haute couture boutique owned by the couture designer Suzanne Dura, while Angela’s and Apropos are more trendy formal-fashion-type stores. Hidden in the side parking lot of a tiny strip mall, next to a pizza shop and chinese take-out, Fancy Schmancy is a luxurious little dress shop with plush carpets, lush sofas, and recessed lighting cast on wall-racks lined with all colors of lace and beaded gowns in protective covers. Wide-brimmed hats rival the imagination. Velveteen and satin platform heels, studded handbags, mirrors from floor to ceiling. Jewelry. It’s something like modern art gallery meets Lady Di’s walk-in closet. The feeling-tone here is “unique”: you could literally choose any style gown for any occasion and the look would be a show-stopper. Of course, you may be wondering what any of this has to do with cheese. In our blog post “A Visit to the City of Cheese,” we covered the small and lesser-known cheese and specialty food shops in New York City. Many people outside of NYC are familiar with Murray’s Cheese and Artisanal’s. Two of the shops we covered were Saxelby Cheesemongers and Formaggio Essex and both are located in the Essex Street Market in Manhattan. The whole market, by the way, is not that big by upstate New York standards. It’s about the size of a quarter strip of Albany’s Lark Street, with only food-related shops and kitchens. Have they declared an all-out cheese war? Not exactly. Because they’re not only competing with each other but also with the big and best like Soho’s Murray’s and 32 other NYC cheese shops as well as the chain stores Trader Joe’s, Whole Foods, Fairway, the corner grocery stores, and online stores such as FreshDirect. How can a small business keep up? Our friend James Rutter at Neal’s Yard Dairy in England offers a fresh perspective on competition in the cheese business. At the American Cheese Society annual conference last month, James spoke about the issues around competition. Coming from both the retailer perspective (Neal’s Yard operates two cheese shops in London) and the distributor’s perspective, he looks at the knowledge and skill of cheesemongers as being of the utmost importance in selling fine, farmstead and artisanal cheeses and offering a good product with a good value. After all, it is the cheesemongers who will sell Neal’s Yard cheeses to the public. So competition is not necessarily a bad thing. A good cheesemonger will educate his customers about fine cheese, it’s history, taste, and storage methods, and will deliver a superior product through the proper handling and care of the cheeses he sells. Doing this well raises the level of interest and knowledge of the population, and people can enjoy delicious cheese from North America, Great Britain, and Europe as if one were there on the farm. Having multiple good cheesemongers, even if at different retail shops, allows each to diversify and specialize their offerings. Saxelby’s developed a reputation for carrying farmstead American cheeses from Northeastern U.S. while Formaggio Essex carries a wider range from North America and Europe. 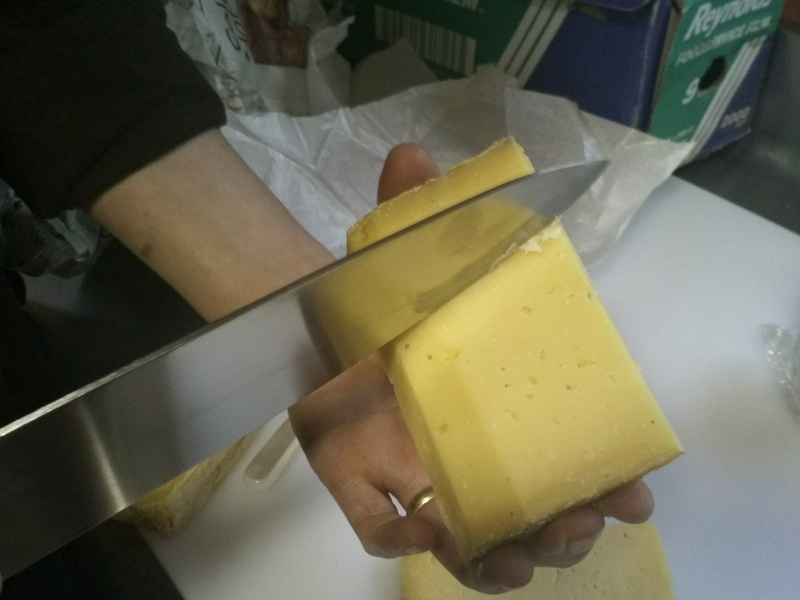 A bad cheesemonger, and mind you, many cheese sections of stores are managed by individuals with little to no knowledge of cheese nor skill in handling and caring for cheeses, is one who sells cheese that has been poorly handled. This leaves a negative impression of fine cheese in the minds of the public – “Wow, we pay a premium price for this? This whole artisan cheese thing is over-hyped!” So bad cheesemongering which gives the cheese loving/cheese curious consumer this experience hurts the entire industry. To remedy this problem, Neal’s Yard Dairy invites the other London cheese shops to attend workshops about artisan dairy industry in Great Britain and proper care and handling of cheeses. Murray’s Cheese also offers a crash course to the public. Shortly, The Cheese Traveler will host classes related to cheese. In the remainder of this post, we will briefly discuss some of the best cheese practices and those less than fair. 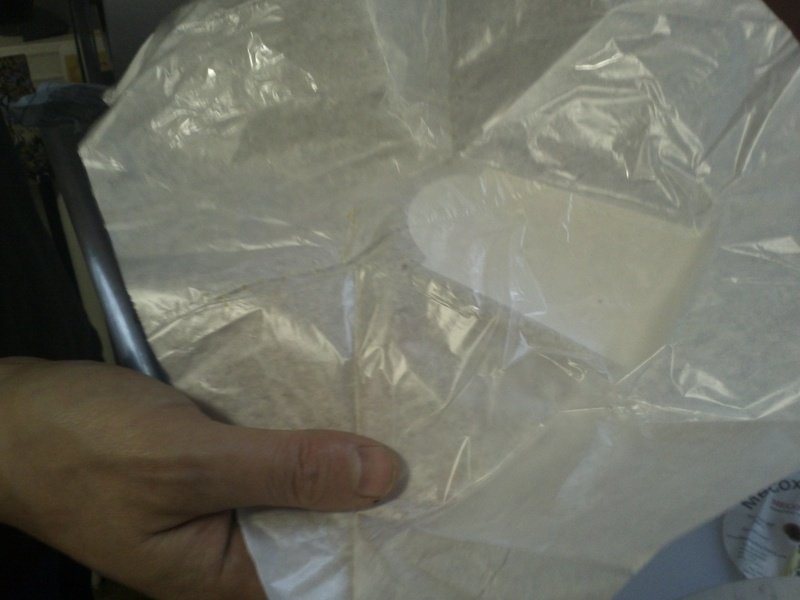 Having consideration for all aspects of the sale, from storage to cut-and-wrap, we notably store our cut wheels of cheeses in the “diaper wrap” method. At no time will plastic touch the face of our cheeses. 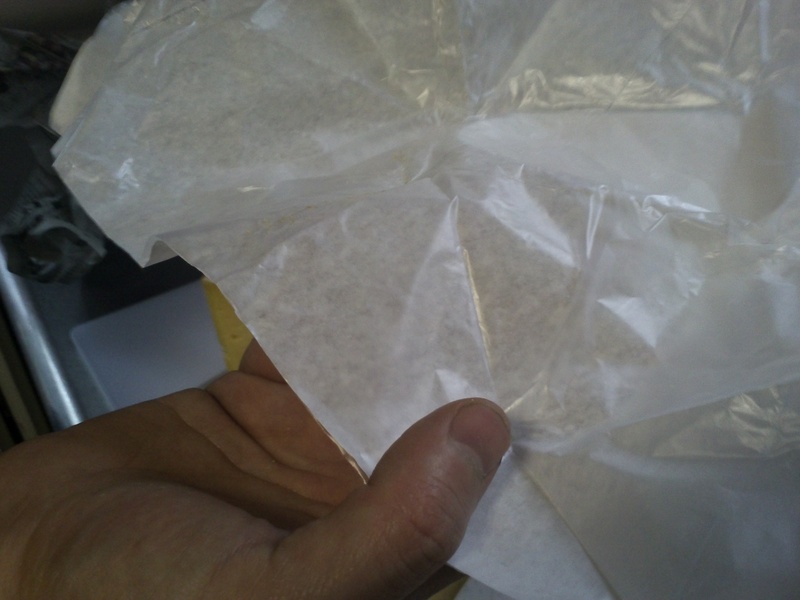 We cut a piece of wax-parchment paper to wrap the face of the cheese and then place it in plastic wrap, thereby sealing the humidity of the cheese. 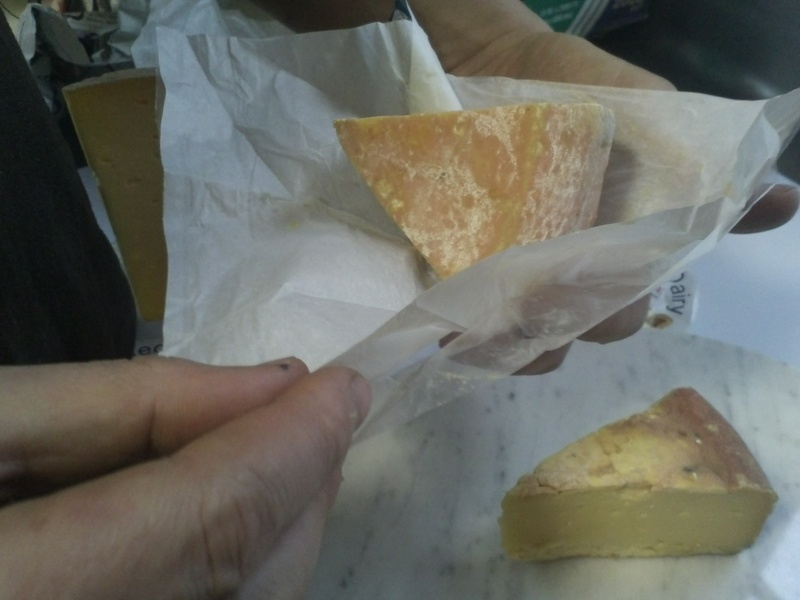 While the plastic may touch part of the rind, it does not touch the “cut face” of the cheese. 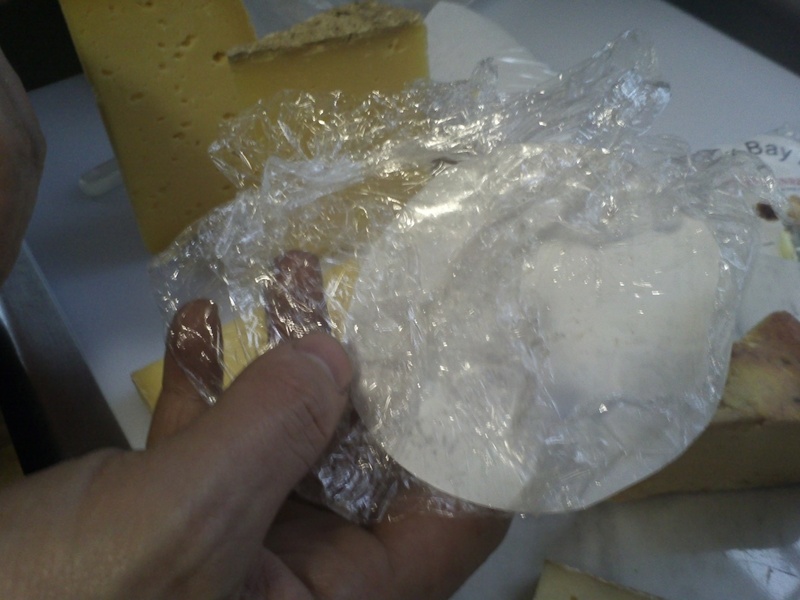 In our retail display we wrap our cut wheels in plastic; however, every morning before we open we unwrap and “face” each cheese and if we feel a cheese has been sitting in plastic too long we face it throughout the day before sampling or cutting your cheese. In all, competition when it comes to cheese is not about having too many stores with too many options. It’s about caring for the cheeses and delivering to the public a superior product in excellent condition fresh from the cheesemaker and aged to perfection. It’s about both breadth and depth of cheese knowledge. And it’s about skill. Our mission is to bring to you great tasting small production cheeses in the condition and flavor profile that the cheesemaker intends from their efforts. And more often than not, you can find some of the best things in life off the beaten path, hidden from plain sight. 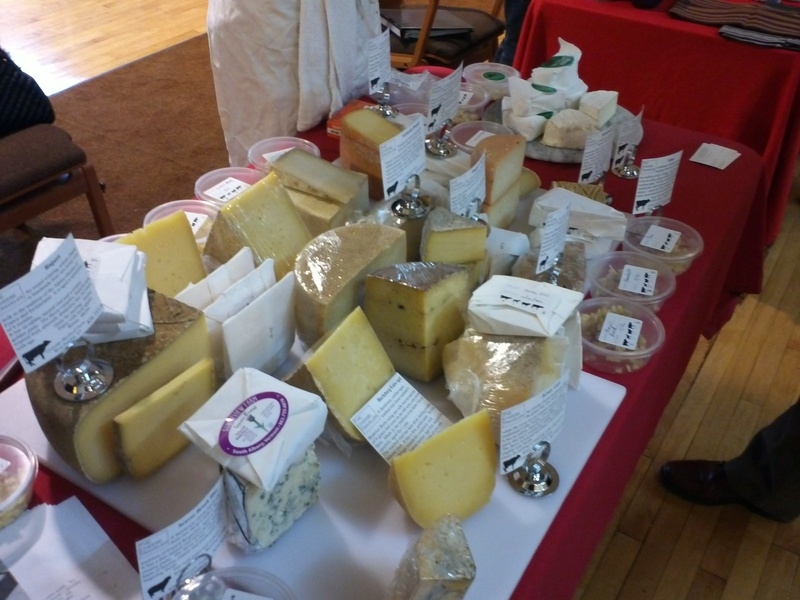 The Cheese Traveler’s booth at The First Unitarian Universalist Society Nov 2011. 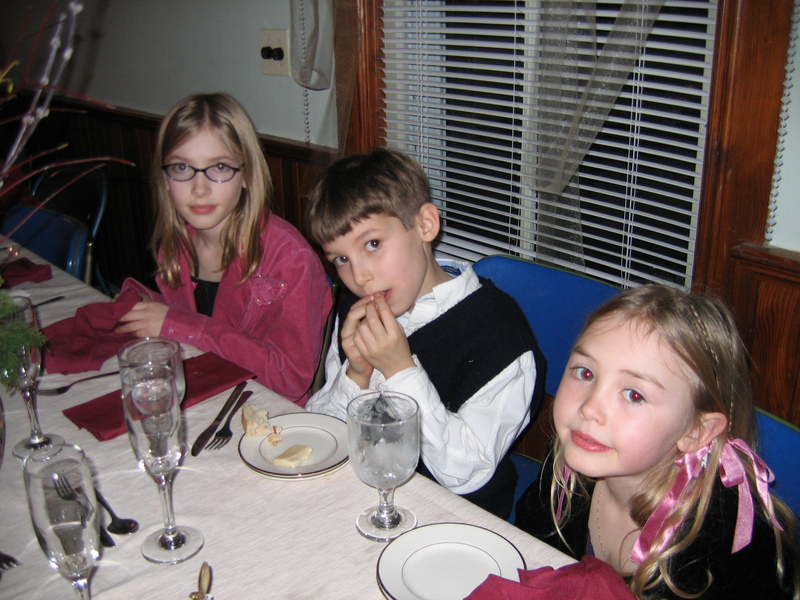 You may know that we are a combined family, originally Autumn living with my dad Eric, and me living with my mom Ali. Dad has been a cheese-kind-of-guy ever since I can remember, which is when I was five, when my Mom married my Dad. 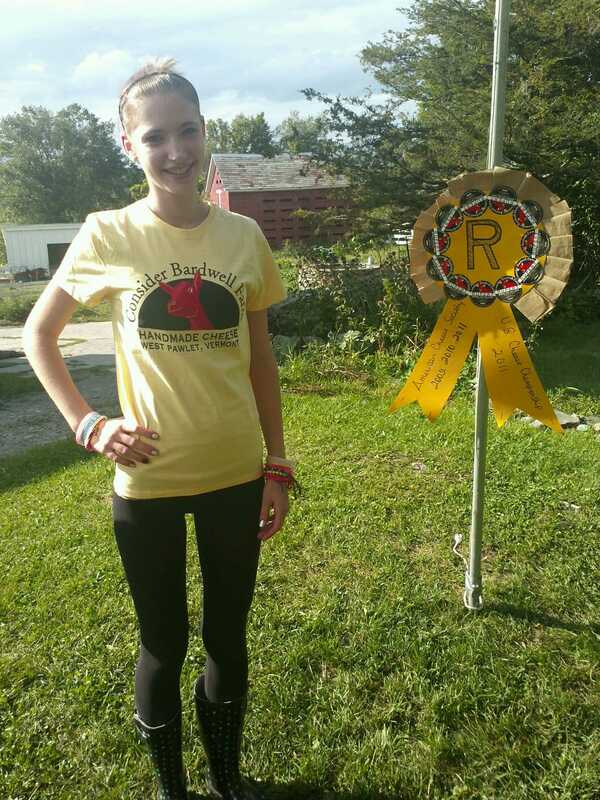 From a very young age, cheese has been a part of my life, but for Autumn, my stepsister, she has been around it all her life. You would think being around it so much, you might get annoyed with it, and you guessed right. 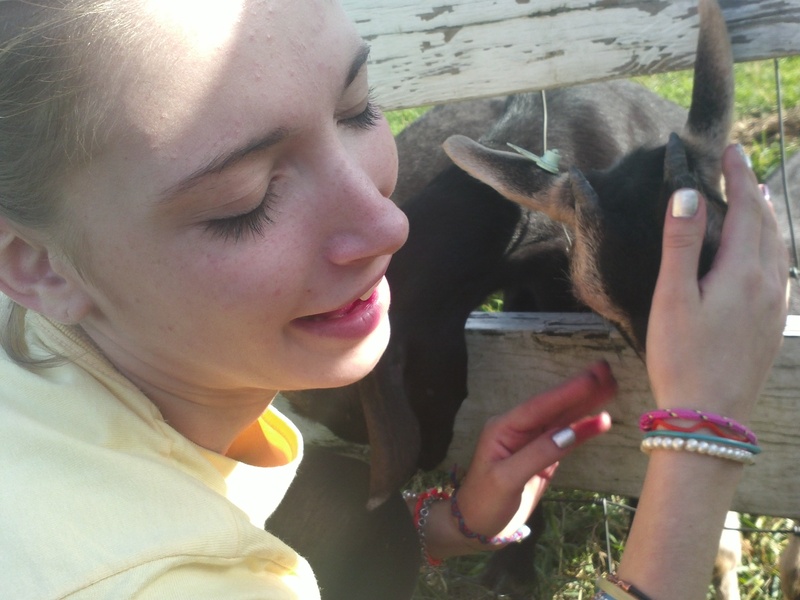 I remember one time, Autumn and I were talking about how we wished we were normal. Now, mind you, we were around seven or eight, and normal doesn’t have a very good definition for little kids. Our idea of normal included: not eating healthy, not going organic, eating at McDonalds, and most of all, NOT EATING CHEESE. Now you can probably imagine how heart-breaking that must have been for my Dad. How could any kids of his not like cheese? But it turns out, we at eight were the only ones who thought like that. My brother Terran loved and still loves cheese. I used to think that Terran only did that because he wanted to be like Dad, but now I realize that he genuinely likes cheese. Now I can understand that to some degree. You see a cheese from France, you want to remember your honeymoon. (At least my parents do, having gone to Paris for theirs.) Or you see an Italian cheese, and you remember going there on a trip with your school. (Of course you want to remember that because you spent a lot of money to go!) But when I see people buying cheese, I don’t think everyone has been traveling before. Not everyone has the time. I see people being engaged in conversations with my Dad, and they seem drawn to him. I don’t know what it is, and I am one of his daughters! But since people love talking to him, and he loves cheese, naturally people end up liking the cheese just because Dad does, and talks about it. He seems to draw people in with his own fascination with the cheese, and I think that is what makes people the most happy to see our cheese stand. Someone who is happy with their job is one big step towards happy customers. The next step is local, and then the third is the variety. All that alone seems to make people like cheese if it isn’t my Dad. 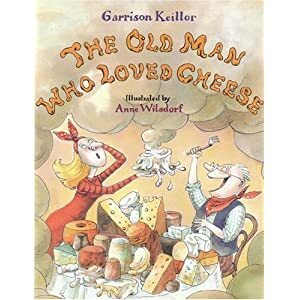 When I was younger, there was this book in our house called The Old Man Who Loved Cheese. 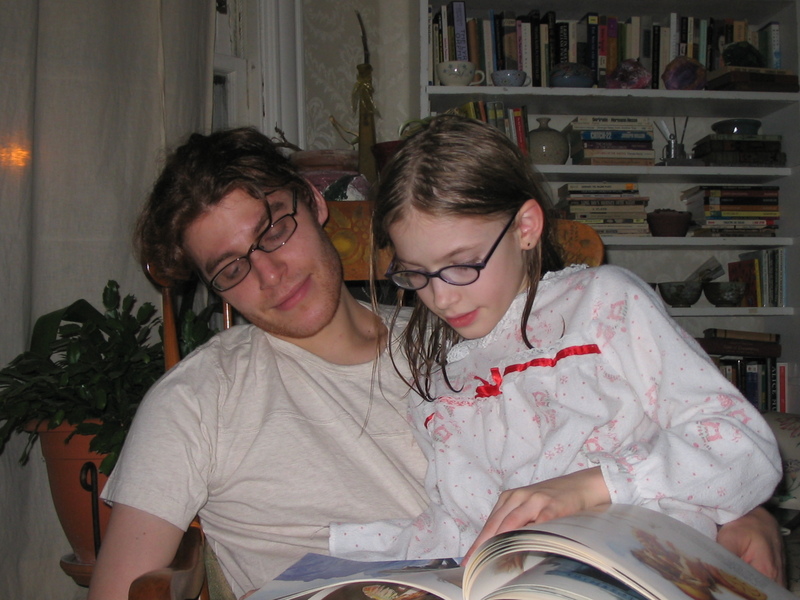 Autumn would always ask my dad to read it to her, before I came into the picture, and boy did he hate it. In it, it talked about this guy who loved cheese, the stinkier the better, and everyone was overwhelmed by the smell. Eventually he gave up cheese altogether because it was pushing everyone away, which is not a great moral, because the man was giving up something that he really loved. 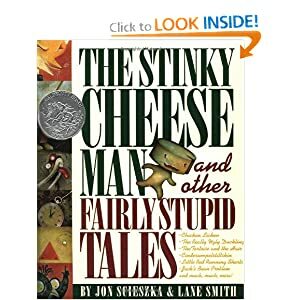 Why my Dad hated that book, I can hazard a few guesses: because not all cheese is stinky, because the guy in the end gives up cheese, and because Autumn had him over-read it, but most likely because the cheese was ‘stinky.’ And although my Dad hated it, let me tell you, it is a well worn book in our house. That and The Stinky Cheese Man and Other Fairly Stupid Tales. The Stinky Cheese Man runs around the pages of the book like the Gingerbread Man, bragging about no one being able to catch him. In the end the fox tricks him and eats him up, which is very nice for the fox, and not so much for the Stinky Cheese Man. It’s pretty encouraging for the people who, like the fox, like to eat stinky cheese! One day, after market, Dad asked Autumn and me which one was stinkier: Cheese or Fish. We both said FISH at the same time, automatically. You might think that because we live around cheese, we are immune to the smell and we should know better, having read all those stinky cheese books, but it seems that most people who come up to our booth are there originally because of the smell. Some people say they are just smelling all the cheese when I ask them if I can help them, and others say that they smelled it and wanted to see what it was. If cheese is so stinky, then why does the smell draw people over? It is not so much as stinky, as just a strong aroma. And even Autumn is not immune to the worst of the strong cheese. There are smelly cheeses. Just not all are. Cheese is good, but my Dad selling it makes it even better. Autumn and I used to (and still do) like to brag about how our Dad started the cheese department at the Honest Weight Food Coop. People would look at us like we were all cute and little kid-ish, then turn to my Dad and ask, “Really?” It was almost as if they were praising him for how well it is going. Or it would be a ‘really’ as in ‘hmm, let me check out The Cheese Traveler. It must be good if this guy started it at the Coop.’ Those ones would and always will make my heart swell. 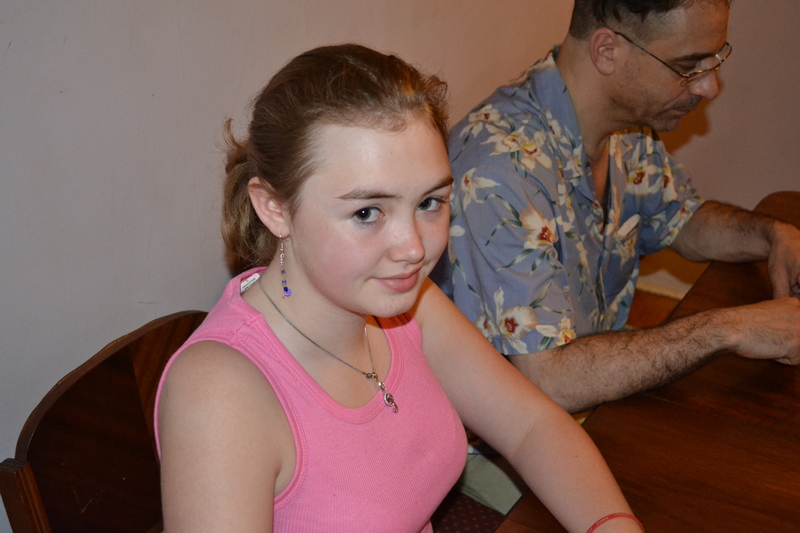 Ava Champion is a Junior at The Doane Stuart School and a novelist. The first of the heirloom tomatoes are ripening on the vines. The luscious red clusters are ready to pick. What better to pair them with than the delectable cream-infused mozzarella “burrata,” fresh basil, and crusty bread? Burrata has been recently coined “the new brie,” “the meta-mozzarella,” or “the postmodern version of mozzarella.” An invented tradition, this cow’s milk cheese (originally made from the milk of Podolian cattle) is a variant on the pasta filata (or stretched curd) mozzarella and filled with the tender, creamy scraps left over from the cheesemaking process. Its name refers to the “buttery” salted fresh cream curds inside its thin skin. Originated nearly 80 years ago and made in Apulia and Basilicata of Southern Italy’s Puglia region, burrata is difficult to find outside of Italy; it is literally a farm to table cheese, produced and eaten the same day. Saving the cheeselover the cost of air-freighting and still offering the old-world tradition in North America, some fine U.S. farmstead and artisanal cheese producers have begun to make the cheese at home. Maplebrook Fine Cheese of Bennington, Vermont recently hired the Italian cheesemaker Domenico Marchitelli, who has been making the cheese for 25 years in Puglia. His Maplebrook burrata was named one of the top five cheeses of 2011 by Food & Wine editor Kristin Donnelley who writes: “Burrata is like the molten chocolate cake of cheese…this Vermont version, made by a Puglian cheesemaker, is as good as it gets.” The Cheese Traveler is excited to announce that we just got in a few of these lovely cheeses, and they are available for purchase at market. Slicing open a burrata, the creamy center begins to spill out like a double or triple cream cheese, but the texture and flavor are like none other. 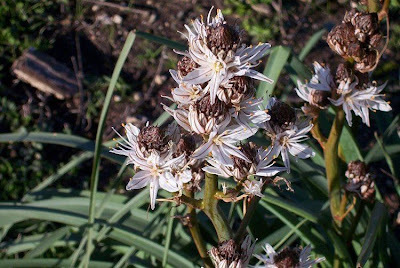 The texture is soft, delightfully fragrant and light on the palate. At one time a purely economical cheese because it used what had been considered the “waste” of the process, burrata is now highly sought after and prized for its uniquely decadent taste, mouthfeel, and rarity. More often today, you will find the cheese wrapped in plastic or preserved in salt brine. In early 2011, cheesemaker Richardo Olanda of Andria, Italy took viewers on a tour of his family’s cheeseworks in CIANetwork’s video feature “Burrata: Puglia’s Molten Mozzarella.” You can see how Olanda makes the cheese here. Compare this to Domenico Marchitelli’s process here. For a step-by-step description of the entire burrata-making process, check out Serious Eats‘ article from the series “Snapshots from Italy” by correspondent Carey Jones. In a bowl toss mesclun mix with half the olive oil and salt and pepper to taste. Arrange on a plate. Top with diced tomatoes, cheese. Throw a pinch of salt and pepper on top and drizzle with the remaining olive oil. Add the sundried tomatoes and basil. Drizzle the balsamic reduction either over the entire plate or on the side. Garnish with chopped parsley. 1 serving. In a saucepan over high heat, bring the balsamic vinegar to a boil, then turn down the heat to medium-low and simmer. Stir to prevent from burning or scorching. Cook down by half or two-thirds until the vinegar is syrupy and coats the back of a metal spoon. As the vinegar reduces it will naturally sweeten. If you wish it to be sweeter, add the sugar during the cooking process, stirring until it dissolves. Pour ice and cool water into a bowl. Remove the reduction from the heat and pour into a squeeze bottle, secure top, and place in the ice bath. After about 20 minutes, the reduction will thicken and be ready to use. Makes 1/3 to 1/2 liter. Jenkins, Steve. Cheese Primer. New York: Workman Publishing, 1996, p. 252. Jones, Carey. “Snapshots from Italy: Making Burrata The Meta-Mozzarella.” Serious Eats. April 1, 2009. online. 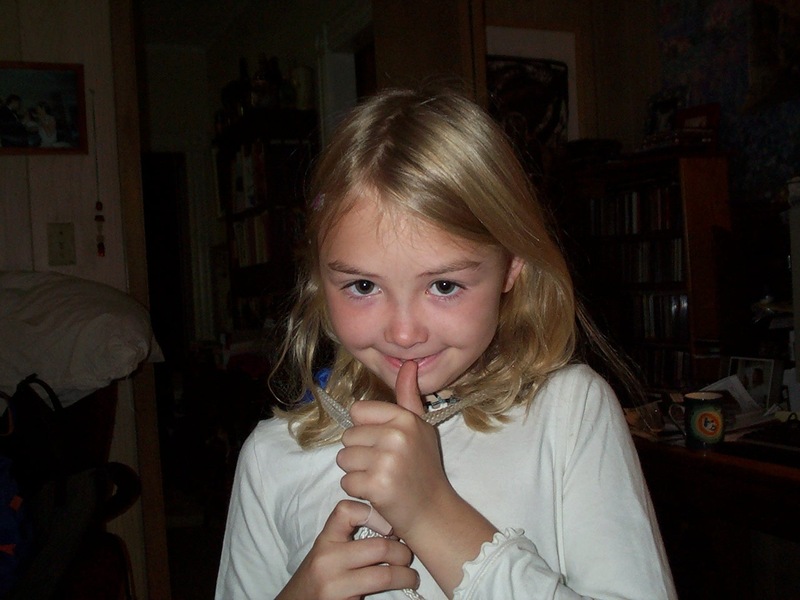 Zeldes, Leah. “Eat This: Caprese Salad Making the Most of the Tomato Season.” Dining Chicago. September 15, 2010. online. Saturday, July 14th 2012 marked the 223rd anniversary of the storming of the Bastille, King Louis XVI’s infamous prison, whose destruction symbolized the beginning of the French Revolution. Although The Cheese Traveler was busy mongering our great local cheese selection at the Delmar Saturday Market, we couldn’t help thinking about this most important of French national holidays. All of our local, New York cheeses are descended from European cheeses, and since October of last year, we have exclusively sold local cheeses at Capital District farmers’ markets. But for our new shop at 540 Delaware, we will expand our line to include small, artisanal cheeses from France and beyond. We have been thinking a lot about the French cheeses we will sell when we open our shop. 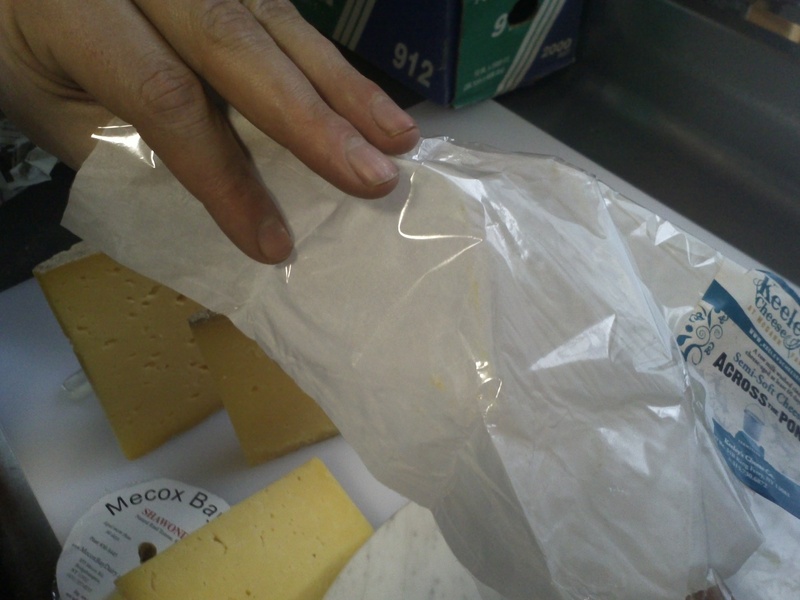 Eric has been compiling his list of cheeses for his opening orders, while we have been waiting – not so patiently, grrrr! – for materials to arrive so we can continue our renovations. As is commonly known, cheese is an integral part of French culture. The history of cheese production goes back to Ossau Iraty, which was being made in the Basque country dating back to pre-history. By the time the Romans came to France, cheesemaking had been in development for centuries – some of these ancient practices still continue today – Salers/Cantal, Beaufort, Fourme d’Ambert, Lagoiule, and Roquefort. During the Medieval times, many of the cheeses we know today were being made by monks in the monasteries – Brie de Meux, Epoisse, Comté (along with other less well known cheeses like Marroilles, Blue de Gex, and more).i Patrick Rance, who wrote the most authoritative book on French cheeses, drew his effort to catalog them to a close at over 750 French cheeses, acknowledging that there were more that were undocumented.ii The passage of time has brought additions and subtractions to Mr. Rance’s list. For French cheeses, Eric is looking to the honed skills of France’s best affineurs or cheese ripeners/maturers. These are masters of their crafts who have completed training and worked for decades often for their small family businesses to develop their skills at selecting cheeses from fermier – or farmhouse – and artisanal – made by hand in small batches in small quantities (it is not artisan merely because producers call it so!) – producers and bringing them to their special aging facilities so that they can mature them to perfection. By working with affineurs in France we will bring small production, perfectly ripened cheeses to Albany. These are both the selection and quality that you only find at select cheese shops and should you travel to France. We are excited to feature those beautiful, hand selected, carefully aged cheeses by Rodolphe Le Meunier, the winner of the Meilleur Ouvrier de France and International Caseus Award (World Champion Cheese Affineur in 2007). 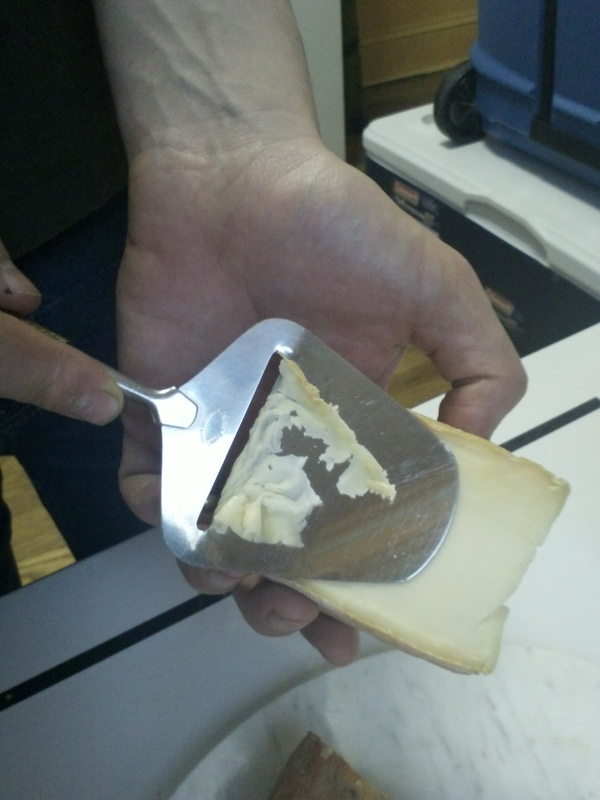 Eric has worked with Rodolphe at the last two Cheesemonger Invitationals. 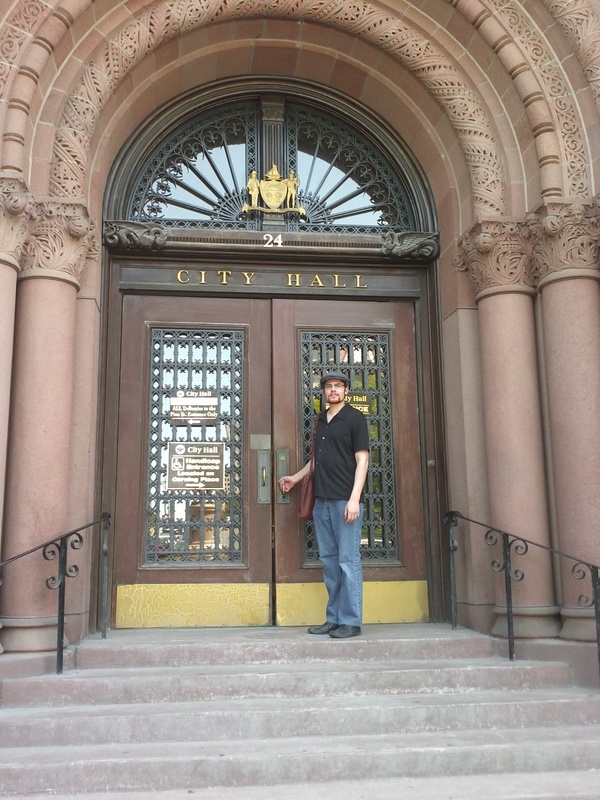 He has carefully cultivated this relationship and is excited to have Rodolphe’s cheese and hand-churned butter in Albany. Over the last few years, Rodolphe has worked with his goat’s milk cheese producers to make pasteurized versions of classic French, small format, goat’s milk cheeses, typical of the Poitou and Loire Valley. These cheeses come in various formats – discs (Galet de Cher), donuts (Courone de Touraine), crottins, pyramids (Pyramides de Touraine), and logs (Ste Maure de Touraine AOP). These are among the finest goat cheeses available anywhere – gorgeous texture with clean but complex flavors. We can’t wait to share them with you. These are how the Loire valley goat’s milk cheeses should be! 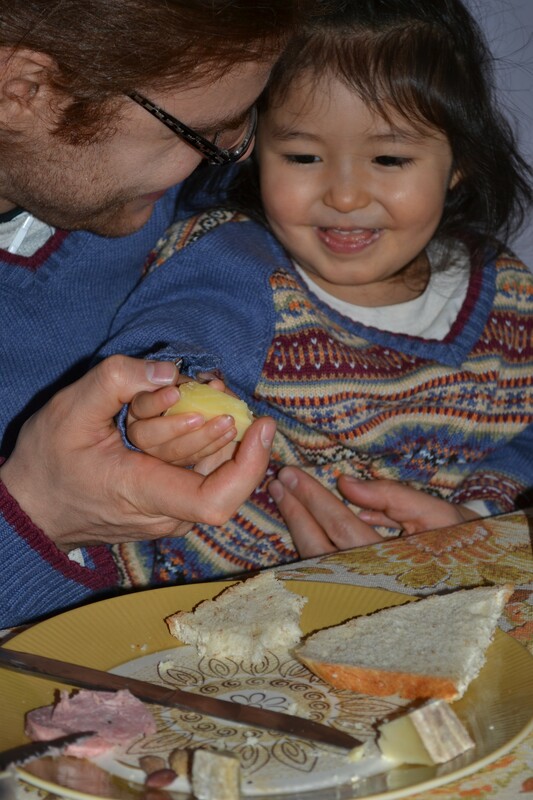 Rodolphe also selects soft-ripened, bloomy rind cheeses from producers in small quantities. These creamy beauties are typically sold by the pallet indiscriminately (Brillat Savarin), but Rodolphe carefully scrutinizes each wheel and selects smaller quantities so that they are higher quality and in better condition to make the voyage to the U.S. Thus, these are the most perfect bloomy rind cheeses from France that you can find not only in Albany but on par with the best of these French cheeses anywhere in the U.S. Le Meunier’s table at the Cheesemonger Invitational 2012. Look at that gorgeous Puit d’Astier! While the cheeses mentioned above are French classics, we are also excited about the less well known cheeses that we shall get from Rodolphe. We plan on carrying too many to list here but we’ll describe a few of them. There are beautiful cheeses from Auvergnes, which were admired in the writings of Olivier de Serres in the 1600: “the cheeses from Auvergne are renowned all over France, from coast to coast.”vii Accordingly we shall sell a rare, fermier (or farmhouse) Saint Nectaire with a well formed natural rind (not the rubbery, factory produced ones with the salmon colored washed rind); Fourme au Moelleux, a blue cheese, washed in a sweet white wine; Puit d’Astier, a giant, 16 pound, sheep’s milk cheese that is shaped like a donut. There are other gorgeous cheeses from Vendée – La Jeune Autise, a goat’s milk, washed-rind morbier style cheese; Tome de Fontenay, another aged goat’s milk tome that is coated in herbs both of which Eric enjoyed at their oozing best after they were heated under a raclette machine last month– oh my God! In addition to Rodolphe Le Meunier, Eric will work with other affineurs – Joseph Paccard, Jean D’Alos, and maître fromager (master of cheese) and affineur Pascal Bellevaire. Joseph Paccard specializes in selecting and maturing delicious traditionally made, raw milk, alpine cheeses from Savoie and Jura – we’ll open the store with Tomme Fermier La Manigodine, made in the tradition of Reblochon de Savioe; Persille de Tignes, a savory raw goat’s milk cheese with a stunning gray, natural rind; and a gorgeous, Tomme de Savoie Fermier. As we grow we will bring in more cheeses from Joseph Paccard. Similarly with D’Alos and Bellevaire the selections will be limited at first. We shall most likely open the store with two beauties from Bellevaire, which Eric became familiar with at Formaggio Kitchen – Vendéen Bichone, a deliciously full flavored, semi-soft cow’s milk cheese from the Vendée region of Brittany; and Trois Lait, a creamy, washed-rind, semi-soft, mixed milk cheese made from goat, sheep, and cow’s milk from the Couserans valley in the Pyrénées. We can’t wait to grow so that we can bring in the exotic goat’s milk blue from the Vendée region of Brittany – Bleu du Bocage. 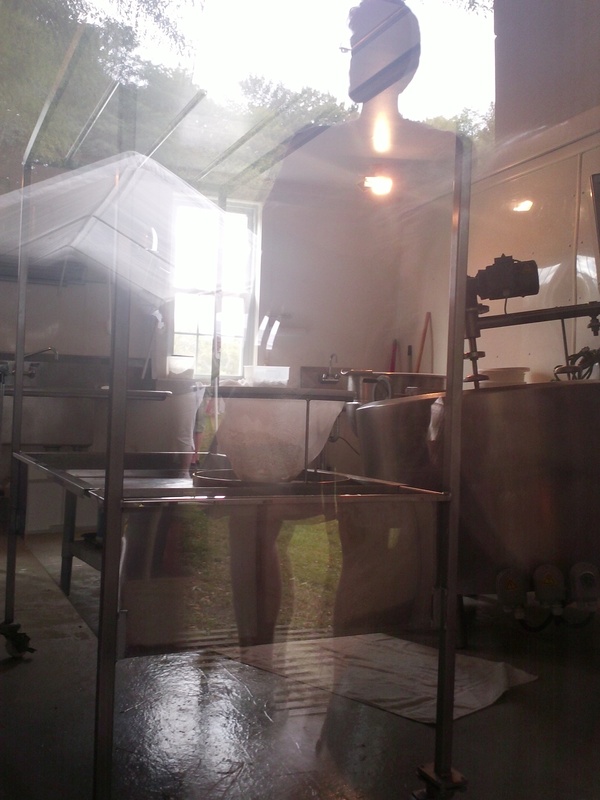 The Cheese Traveler is committed to this level of production and quality of cheese in order to bring those cheeses that are made in the countryside rather than the factory to Albany. These cheeses are small production and are similar to what you would find should you travel to France. To taste them is to travel to the French countryside; to experience and come to learn the qualities of the locale, the traditions of the cheesemakers and affineurs, and the heritage of the cheeses. It is with similar scrutiny that Eric will select cheeses from other countries to join the fine American farmhouse and artisan cheeses produced regionally and across the U.S. Thus, we have revealed the other meaning of the name – The Cheese Traveler. For while we have loved our trips to France, and would encourage everyone to travel to France and other places, we also know that we can have a little bit of France in the smallest production cheeses and artisan foods. Such traditional artisan foods get closest to the land (the terroir as in good wine production) and cultural traditions of their home countries. And by sharing these taste experiences with our companions here at home in the U.S., we are able to share in their fascinating flavors and rich stories. i Rance, The French Cheese Book, xvi-xvii. iii The Columbia Encyclopedia, 3rd ed. 1963, p. 771.
v Jones, P.M. The Peasantry and the French Revolution. London: Cambridge University Press,1988, p. 95. So What Do You Do with Fennel Leaves? All risottos use the same method of slow cooking Arborio rice, a highly absorbent rice from Italy, adding a dense stock and white or light red wine, and finishing with a flavorful cheese to create a rich, creamy texture. Because Arborio rice is imported and very fine, it can be costly. This recipe substitutes half of the Arborio rice for pearled barley, which has a similar texture and absorbency. Other ingredients can be grown in your garden and found in a local farmer’s market or specialty foods shop. In this recipe, the vegetables garlic scapes, spring onion, and snap peas are balanced with the herbs and spices fennel frond and French paprika so as not to overpower the delightful taste of the washed rind cheese used. Melt butter in a pan on medium heat. Heat stock in a separate pan and keep covered on low heat. Cut scapes and onion into butter and sauté until onions are semi-transparent. Add a splash of Banyuls (or similar light wine or rice vinegar). Add rice and barley and sauté in the butter for 1-2 minutes. Begin to add the warm stock, one cup at a time as the rice adsorbs the liquid. Stir often. When the rice and barley begin to plump, add paprika and salt, snap peas and fennel fronds. Add wine. Finish with your choice of cheeses mentioned. Stir until the cheese melts evenly throughout the risotto. The risotto will be done when the rice has taken in all the flavor and is al dente. 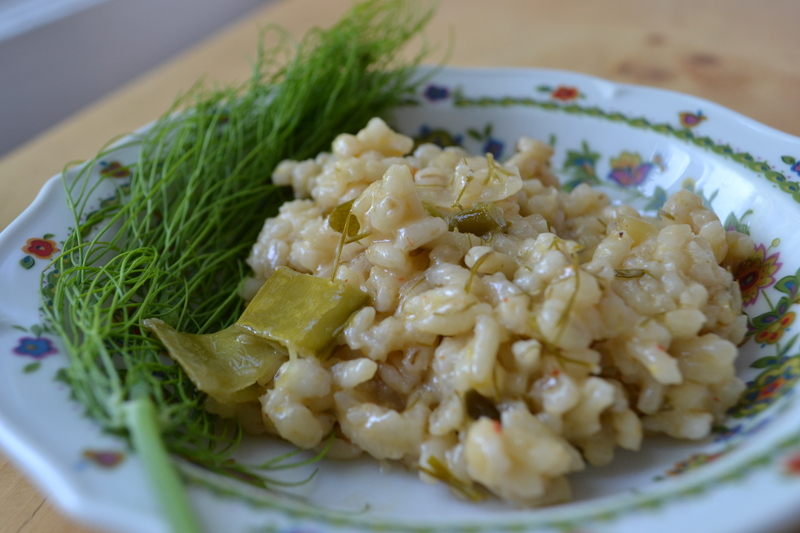 The risotto will look creamy and generously wet around the rice and barley, neither dry nor runny. Pepper and salt to taste. Fennel fronds and thick greens make a wonderful base for cooking fish, and the flavor of fennel pairs particularly well with salmon. This recipe steams the fish over a bed of greens, and the fish soaks up the flavors as the steam rises. Use a dutch oven or similarly large, heavy pot with lid on the stove top. Heat the pot to medium to low. Line the bottom of the pot with the cut fennel fronds, collards, and kale. Gently place the salmon on top of the greens. Juice the ½ lemon on the salmon. Add 1 tbsp olive oil to moisten the salmon and greens. As the salmon steams, the oil will release into the greens and the greens will protect the salmon from burning. Add a splash of Banyuls vinegar and drizzle of Herbes des Provence olive oil. Let cook until the fish is pink and flakes. Add salt and pepper to taste. June is National Dairy Month, a time that America has set aside to celebrate the bounty of milk produced across the country. Summer months experience a surplus of milk after the brief Spring months of live births and the coming in of the milk. At this time animals are pastured and milked twice a day. 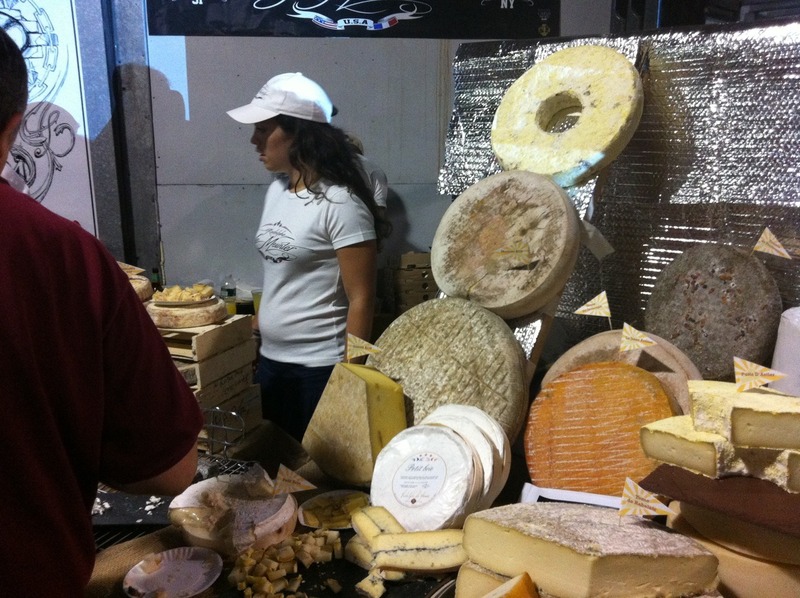 At The Cheese Traveler, we love cheese and celebrating all things cheese-related. Milk is the number one ingredient in the cheesemaking process along with salt, culture, and rennet. It is also the official beverage of New York State. In our research on the history of National Dairy Month, we had some surprising discoveries. The auspicious date – 1937, the first “National Milk Month” later coined in 1939 “National Dairy Month”– coincides with one of the largest labor strikes in New York State history – that of the Dairy Farmers’ Union. As milk production increased with the aid of mechanical and scientific advancements in the early decades of the twentieth century, the depression era significantly decreased the demand for milk and dairy products. Moreover, the cost of transportation of milk increased. Retailers and large scale cooperatives responded by slashing prices, engaging in a price war, and developed a monopoly in the state undercutting the cost of production for small, family farms. So, as the National Milk Month campaign advertised at local shops to increase the demand for a surplus supply of milk, farmers were waging a battle on the farm front to stabilize prices on milk, respond to the increased cost of production, and secure their small farms. The Dairy Farmers’ Union strike was not the first dairy strike in New York State, nor the first instance of corruption in New York’s dairy industry. In 1858, the “swill milk” scandal of watered down, contaminated, or doctored milk was uncovered in New York City which necessitated standardized practices in the industry for public health safety. 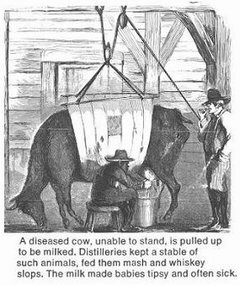 Contaminated and diseased milk from poor milk handling to animal cruelty – such as feeding distilled whiskey mash to cows or lifting and milking a dying cow – was often and unknowingly the cause of transmission of infectious disease. In 1933 as commodity prices fell, New York State’s milk strikes spread like wildfire and grew quite violent, bringing the state close to marshall law as one New York Times reporter noted. The 1937 strike, following the largest drop in milk prices in fifteen years, was eventually successful, as small family farmers shut down two of the largest milk cooperatives in the state through persistent and surreptitious means, from picketing with long boards with exposed nails to protect their picket lines from anti-strike motorists and greasing the train rails to prevent milk shipment departures from the facility. Some memory of the battle persists today as small farmers still bemoan the large-scale factories’ hold over pricing and the market. Small scale dairy farming continues to be difficult to near impossible to sustain on only commodity production. To celebrate National Dairy Month, we at The Cheese Traveler see cheese production as the natural response to summer’s increased milk supply. It takes approximately ten pounds of milk to make a pound of cheese. A gallon of milk is about 8.6 pounds, so to make one lovely ten pound wheel of Madeleine for example, Sprout Creek Farm uses over twelve gallons of goat’s milk. Likewise, cheesemaking has been the historical solution to excess milk supply. Other countries with a long history of incorporating cheese in their diet such as Greece and France experience lower rates of hypertension and obesity in the population than those in the U.S. The health benefits of cheese – offering a high-quality protein as well as calcium, phosphorus, and Vitamin A – provide a strong support for the continued development of cheese production and its ties to local and regional food culture. In New York State, home of The Cheese Traveler and the third largest dairy-producing state in the country, small farms have turned toward farmstead and artisan cheesemaking as a value-added option to increase their viability. Value-added products are those that take a commodity such as milk and add labor, time, and craftsmanship to it to make it more valuable. The art of cheesemaking adds value in several ways: a low price commodity becomes an economically viable agricultural product, a perishable becomes an “aged” product, saving the cost of freezing or keeping milk cooled through the winter months of low milk production, and a commodity with little variation becomes highly diversified in form, taste, and craft. 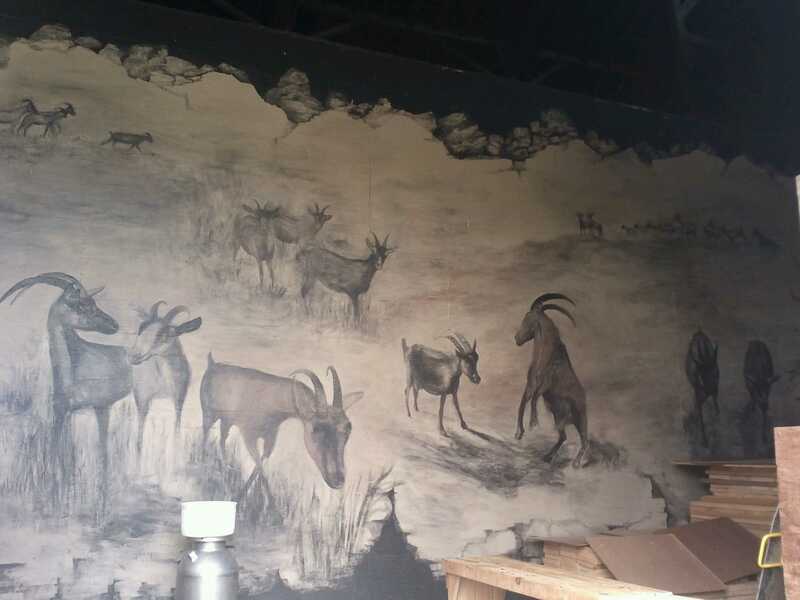 The Cheese Traveler is deeply committed to selling the cheeses of these small producers who either use their own milks produced on their farms or use locally sourced milks from natural, grass-fed, pastured, or organically fed goats, sheep, and cows. So, as we commemorate June as National Dairy Month, let us also remember the efforts of our forbears who have fought to make food safe, affordable, and delicious. Cheese is a wonderful addition to any meal and can be added to enhance the flavor of many summer dishes. We have been enjoying the classic Mediterranean beans-n-greens with white beans, radicchio, mizuna, fresh oregano, rosemary, thyme, and garlic scapes, onion, balsamic vinegar; sautéed in butter; finished with olive oil, salt, pepper, and Toma Pepato from Cooperstown Cheese Company. We are so excited to announce that tomorrow is the start of the Delmar Farmers Market and The Cheese Traveler will be selling cheese there for a second year. 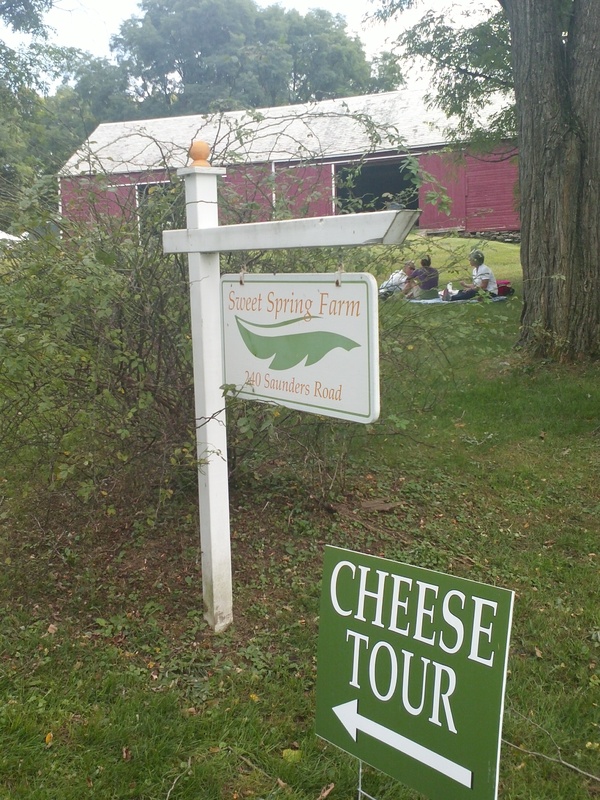 Come by between the hours of 9am and 1pm to get your fantastically tasty summer cheeses (click here for directions). The Cheese Traveler will feature an array of small production farmstead and artisan cheeses, many of which are award-winning, from farms within a fifty mile radius of Delmar. 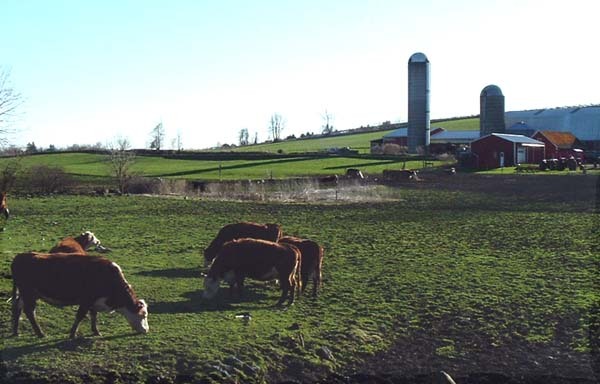 3-Corner Field Farm is nestled in the Battenkill River Valley at the foothills of the Green Mountains on the border of New York and Vermont. 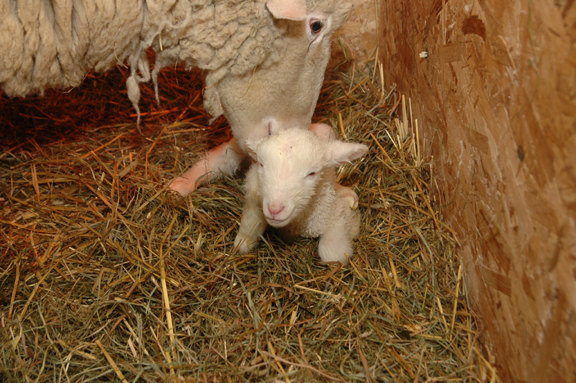 They are one of the few farms in the country that milk sheep for use in the production of gourmet cheeses and yogurt. Their sheep are raised with care and respect on beautiful, organically managed pastures, and are never given hormones or unnecessary antibiotics. 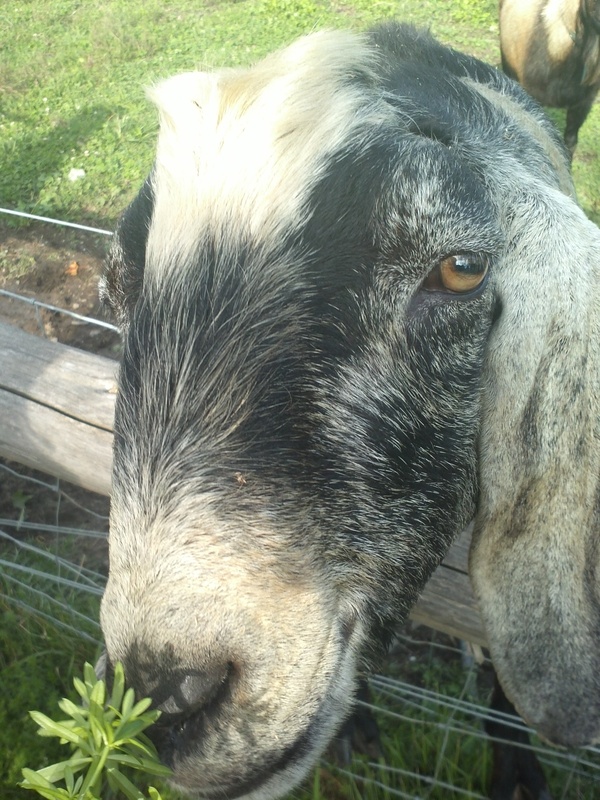 They are raised the old-fashioned way: outdoors, on pasture, eating natural grass, clover, and alfalfa. Handmade by Ira Grable using raw milk sourced from two small jersey cow dairies. Crafted in the tradition of an English Stilton. Berkshire Blue has won many international awards. 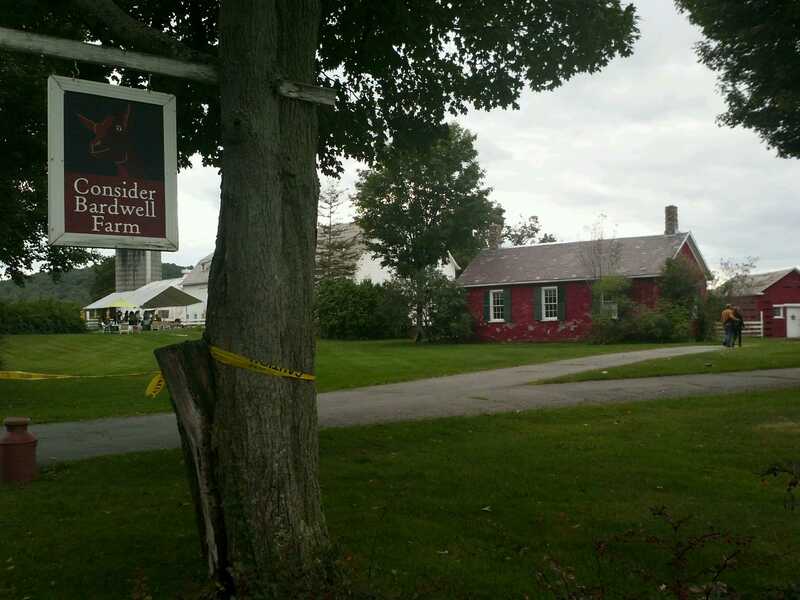 Beatrice Berle owns and operates a beautiful, 600 acre, certified organic, solar powered, 1840’s farmstead. She hand-crafts artisan cheeses, using milk from her 6 cows. Known iconically as the “The Red Roof 6 miles south of Cooperstown on Route 28,” Cooperstown Cheese Company handcrafts artisan cheeses from locally-sourced, raw cow’s milk. Their Toma Brand Cheeses are made from milk from Brown Swiss cows raised naturally and hormone free on Lester Tyler’s family farm, Sunny Acres Swiss. 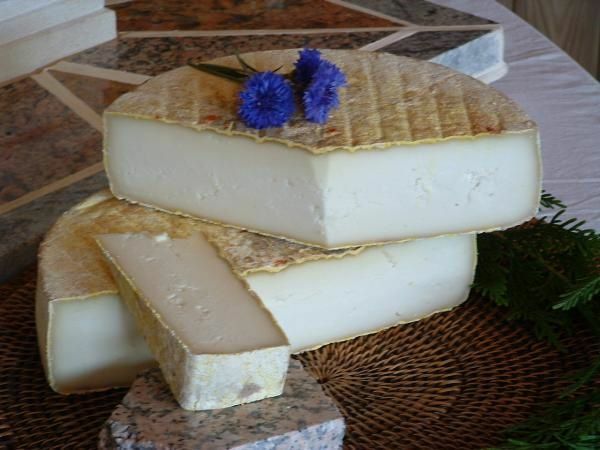 Their Jersey Girl Colby is made with grass-fed, raw milk from Autumn Valley Farm in Worcester, NY. Located in Williamstown, MA, Cricket Creek Farm handcrafts award-winning, raw, grass-fed cows milk cheeses made by certified artisanal cheesemakers. 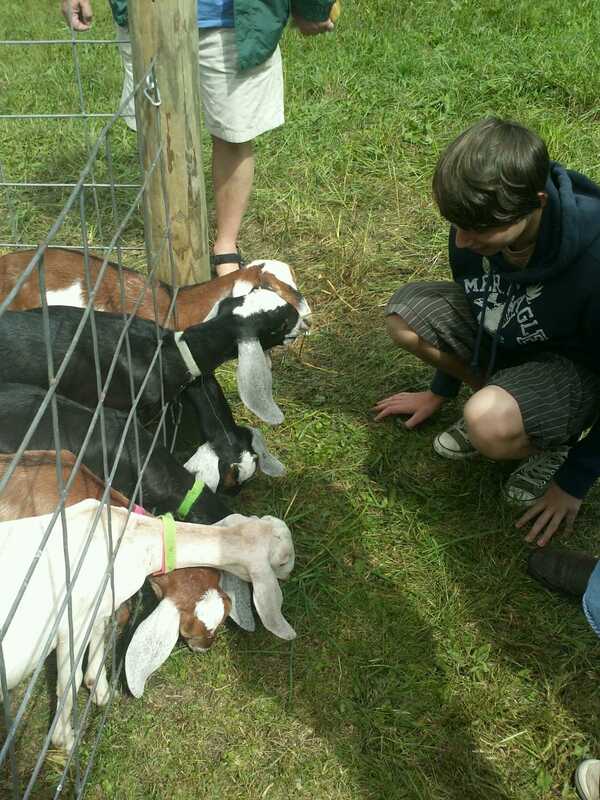 The land is cared for organically; the farm is Certified Humane, has a bakery, and sells eggs, beef, and pork. Produced in New York’s bountiful Hudson Valley, Old Chatham Sheepherding Company’s award-winning sheep’s milk cheese and yogurt are celebrated for their uniqueness and distinctive flavors. Around town when we get asked what we do, we say with enthusiasm, “We’re cheesemongers!” Eric has been a cheesemonger and cheeselover for 14 years and founded the cheese department at Honest Weight Food Coop in 1999. But frequently the follow-up question is “How do you like making cheese?” or “Where do you make your cheese?” Sometimes, we are confused with local cheesemakers: “So you’re the ones who make the goat cheese,” referring to R&G Cheesemakers from Cohoes, NY. Our most recent favorite came from a brief conversation at a From Scratch Club food swap. Alifair, the wife of the cheesemonger, was dubbed the “Mistress of Cheese” by one community member and another responded, “So you make the cheese and he sells it!” A classic case of mistaken identity, we have ascertained some basis for the confusion. As the economy turned from small retail shops to large supermarkets and industrial-made products, terms like cheesemonger, fishmonger, and butcher (or its earlier form fleshmonger) fell out of use. 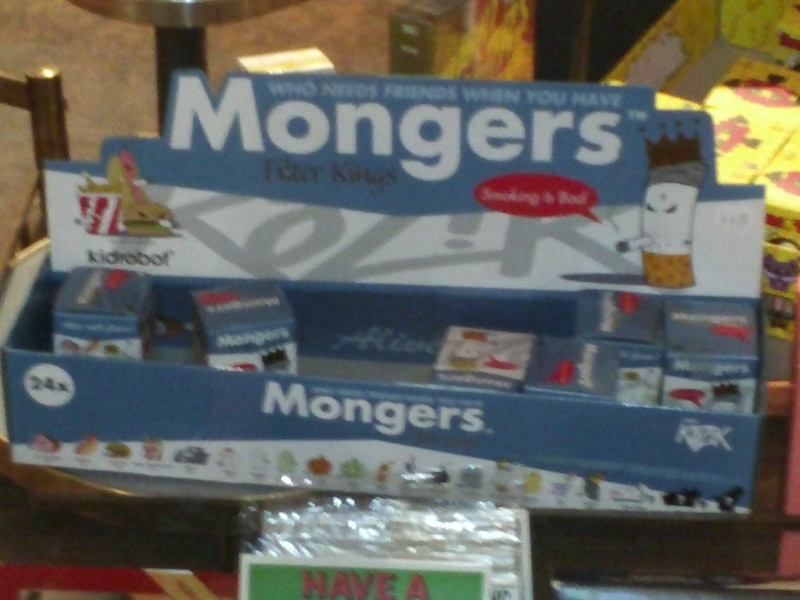 “Monger” derives from the Latin mango– and Germanic suffix –er to mean a merchant, dealer, or trader of a commodity. Cheesemonger, by extension, means one who deals or trades in cheese. In the U.S., cheesemongering is on the rise. Large supermarkets are reimaging themselves as shops within stores and calling for cheesemongers to manage their cheese departments, and individual retail cut-to-order cheese shops are popping up in cities large and small. A staggering 1,600 domestic U.S. and Canadian cheeses were entered into the American Cheese Society’s annual competition in 2011, the largest number to date. With so many amazing fine cheeses produced in the States and abroad, a consumer needs a cheesemonger to help steer the palate toward individual interest. To meet the growing industry, demand, and to standardize practices, this year The American Cheese Society inaugurated a Certified Cheese Professional Exam for both practicing and aspiring cheesemongers. The recorded use of the term monger dates back to the 16th century, when its meaning synonymously referred to “a person engaged in a petty or disreputable trade or traffic.” This is the meaning Shakespeare’s Hamlet uses in his famous line to Polonius, adviser to the false king. In the second act, Polonius asks, “Do you know me, my lord?” and Hamlet replies, “Excellent well; you are a fishmonger.” They go on for a while about honesty and the state of the world, until Hamlet underhandedly castigates Polonius for peddling his daughter Ophelia. Polonius, ill understanding Hamlet’s satire and wit to play off the multiple meanings of words, thinks Hamlet clearly mad…or madly in love. He says in an aside, “How say you by that? Still harping on my daughter. Yet he knew me not at first; he said I was a fishmonger. He is far gone, far gone.” Polonius only understands the one use and not the other, and the audience sees him as a doddering fool for his omission. Laughing at a clownish old man is great for drama, but not for polite society, of course. In today’s society, the derogatory tone of the slang meaning may persist in our thinking about the word monger and could explain our aversion to its use. For better or for worse in the cheese business, words can contain multiple meanings. 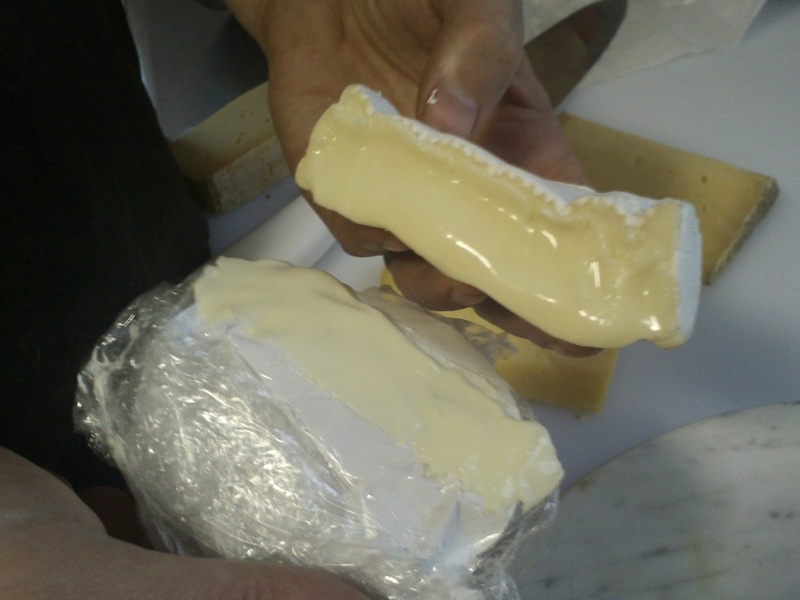 Unlike the English, the French fromager is used interchangeably for both cheesemonger and cheesemaker. What confusion this may naturally engender! 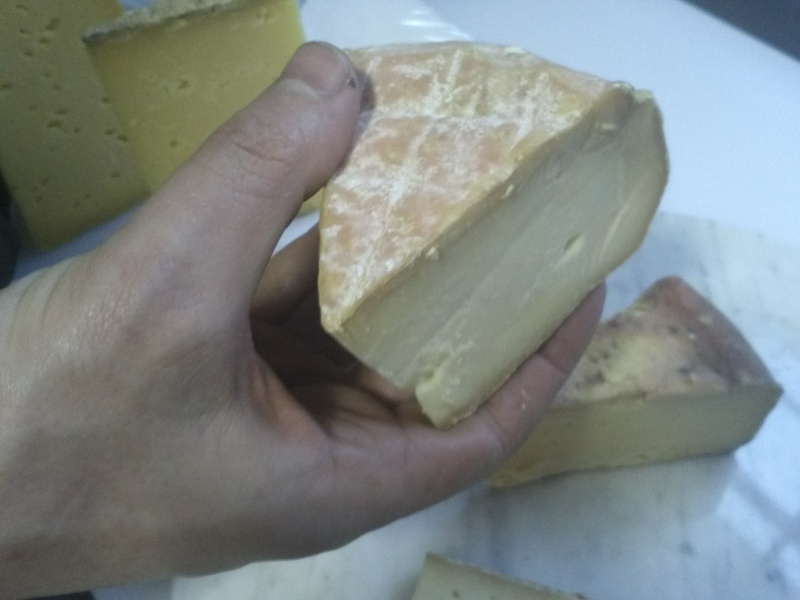 To top it off, an affineur buys cheese, ages cheese, and resells the wheels at their aged perfection, holding many different types of cheeses in his cellar at any given time – is he a cheesemaker or a cheesemonger or both? At a small producers market, a cheesemaker might purchase space at a booth to become both a monger and a maker. In the city, larger cheese shops can store a wide variety of wheels and types of cheeses in their own caves or aging facilities. The American Cheese Society in its blog tagline breaks down the concepts into the following categories: Cheesemakers, Cheesemongers, Cheeselovers; and says, “All are welcome here as we celebrate all things cheese!” Not only does ACS note the difference between mongers and makers, but also includes the cheese enthusiast, the aficionado, or the curd nerd. While The Cheese Traveler falls into the cheesemonger category, we are beholden to the relationship we share with local cheesemakers, such as R&G, who make our business possible. Conversely, cheesemakers appreciate cheesemongers because their shops can reach a wider audience of cheese lovers for their product. All in all makers, mongers, and lovers form a trio around cheese and its importance to culture. Cheese etymology portrays a unique way of seeing the difference between cultures – no pun intended. The word for “cheese” throughout the modern European languages can differ slightly as well as to a great extent independent of regional proximity. The words fromage (French), formage (Medieval French), and formaggio (Italian) derive “from the Latin word for the basket or wooden box in which compressed curds were molded to make cheese, forma, which itself came from the earlier Greek term phormos (This is also where the English word “form” comes from). For their part, the English word cheese, the Spanish word queso and the German word Kaese all come from the Latin word caseus, the foodstuff itself.” Ultimately, a cheesemonger or maker focuses on the “cheese” while a fromager focuses on the “form.” A food so simple in its ingredients – milk curd and rennet, a coagulating agent that separates the curd from the whey – develops into a vast number of different types of cheeses. Some cultures have grown to see the final product, the cheese itself, of the utmost importance while others see the form that initiates the cheese as the item of note. In the States, and more locally in Albany, NY, we have oodles of local farmstead and fine artisan, specialty cheeses to choose from at The Cheese Traveler. The storefront is coming soon to 540 Delaware Avenue in the heart of Albany right off I90 and 787. Look for us in the coming weeks at the June 2 opening of the 2012 Summer Delmar Farmer’s Market at the Bethlehem Central Middle School in Delmar, NY.